Check out the book that everyone will be talking about once they've heard of it and have run out of other things to talk about! This little literary gem is hitting Ottawa in a big way with coveted space on the shelves of: Perfect Books on Elgin Street, All Books on Rideau, Chapters on Rideau and the almighty End Hits Records on Dalhousie! 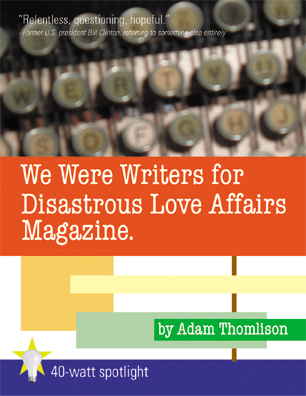 We Were Writers for Disastrous Love Affairs Magazine will make you laugh even as it brings you to tears, resulting in a weak sort of snorting sound and a sigh that sounds more like a wheeze! Ranging from a poetic car wreck to a kneel-athon in the name of love, featuring shotglasses worn as shoes and an international manhunt, the six stories that fill this book to its paper brim burst with sadness and absurdity. It's a combination that only former Frank Magazine prankster/writer/professional jerk Adam Thomlison could cobble together, like a mad shoemaker who makes sad, absurd shoes. Here's the basic premise: six short stories, six examples of how someone or some people has (or have) failed in what's supposed to be the simplest part of human existence: falling in love. But what glorious failures! In doing so, the stories pose questions to love; questions too gritty for the love stories, too lovey for the gritty stories. She's Just As Ruined tells the story of one sucker who fails her way from Ottawa to Paris and back in a matter of hours, ending up in an exhilarating street chase through the underbelly of urban Toronto running after something we've all lost but were a little more willing to let go of. The title story, We Were Writers for Disastrous Love Affairs Magazine, is a short, fast jab at the heart of life's third certainty: the painful breakup. Staring across a restaurant table at yet another new ex-lover, it's hard not to want to find some greater purpose from this repetitive dance of the disconnected; to share the breadth of experience gleaned from a lifetime of romantic ruin. Set Sail and Sink is the story of a lonely Canadian kid who sees his hometown crumble under the grind of change and tires of saying goodbye to friends leaving like rats from a sinking ship. He takes his turn at leaving and flees south, his flight turning into a humorous travelogue and coming perilously close to becoming a love story before he finally falls off the edge of his map. Car Crash Catharsis earned Canadian Authors Association recognition for its tale that shows what would normally be passed off as wanderlust to be more like escapism and questions where loyalties can often be misplaced. The Liquid Courageous is a slightly absurd (in a shotglasses-as-shoes sort of way) look at the use of alcohol as a crutch and how it, followed by a jealousy chaser, can make a mess of the random friendships that make life worth drinking to. 45 Degrees of Love, the other novella in this menage a six, is about the darker side of love and how we can be oblivious to what it's doing to us and what we, in turn, are doing to the objects of our obsessive affection. When kneeling at the altar of love, what can you expect except a set of sore knees? But what do the media say about all this?